Sherlock Holmes: A Game Of Shadows Blu-Ray Review And Giveaway - Are You Screening? Sherlock Holmes: A Game of Shadows, despite somehow seeming to pass through theaters without nearly as much fanfare as one might expect, was one of the year’s best, and the exception that proves the sequel rule. This time Sherlock takes on Moriarty, who is delivered brilliantly by Jared Harris, and finds himself pushed to the limit of his abilities. One of the best aspects of this particular “episode” in Sherlock’s story is that much of what needs to be figured out is simply what Moriarty’s game is exactly. Holmes sees the web, and pieces together the clues that lead to Moriarty as the designer of some sinister scheme or other, but there’s a lot of leg and mental work that go into finding his ultimate goal. This not only allows for the usual fun that is just watching Sherlock Holmes be Sherlock Holmes, but gives us ample opportunity to run along with this more kinetic approach to the Holmes world, and lets us see his love/hate relationship with Watson play out in believable, manageable ways, without any of it having to lose its way for the purpose of progressing toward a resolution already revealed. 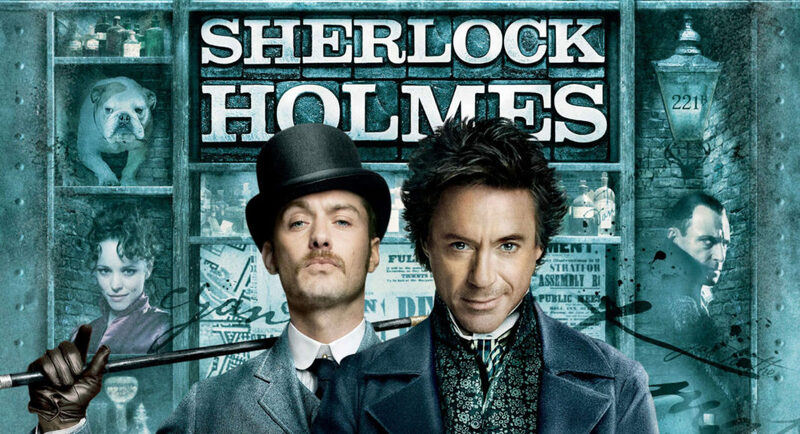 Both Robert Downey Jr. and Jude Law manage to continue their characters in a way that is as entertaining and complex as they did in the original, and that was certainly one of the big question marks going into a sequel. It seemed their banter and pseudo-animosity might have run its course, and a continuation might feel labored, but if anything, they are more fun to watch than before. Though not completely without its flaws, especially when it comes to Guy Ritchie’s fascination with slow motion, Sherlock Holmes: A Game of Shadows is not only bursting with bang for your action entertainment buck, it’s also far more clever in its construction and plot development than just about everything to come down the “action” pike in the last decade. The Blu-Ray itself delivers great video, and while this isn’t a title that might leap to mind as being one that showcases all that Blu-Ray has to offer, it really is. Sure, “shadows” is in the title, but this isn’t a film with a lot of explosions, panoramic vistas, or minute details. Still, you’ll be glad you have the video capabilities when you’re watching the darker scenes, and when you’re running through the more impressive action sequences. This is also a release that might be misleading in its apparent lack of special features. With a list of one, some people may not see the Maximum Movie Mode as quite the host of features they’re used to, but it’s comprised of several featurettes that add up to around 90 minutes of bonuses. You’ll find the usual suspects, including some behind-the-scenes featurettes that focus on the direction, specific characters, and the like, and a couple that go into more detail on the plot elements, such as Moriarty’s grand scheme (see full list below). They’re put together well, and manage to put the fun spin of the movie into the bonuses. The whole thing is hosted by Robert Downey Jr., and also pulls you along with storyboards, stills, etc. It comes together to create a nice addition to the film, but some may still find themselves wishing for a bit more. I don’t mind leaving out some of the standards, like deleted scenes and commentary tracks, but they might have been nice here. The real treat of the release is the App that is available for iPad and Kindle Fire. We’ve seen several of these offerings, and as time goes on there will probably be an App for every release, but this one stands out among those available so far. The content provided is much better than most, giving you real additional bonuses, and if you have an iPad2 or Kindle Fire, the App will control your Blu-Ray player, letting you move around through the film and bonuses of the Maximum Movie Mode. In the end, this is pretty much a must purchase. You won’t be disappointed with the film, or the Blu-Ray release. Below check out some more info, image gallery, some videos, including an introduction to the App, and then enter to win. The Sherlock Holmes: A Game of Shadows™ Movie App enables your iPad 2 or Kindle Fire to control your Blu-ray™ movie and expand your movie watching experience. Sync the app with your Blu-ray disc of Sherlock Holmes: A Game of Shadows to start exploring the rich and exciting history of Sherlock Holmes. The Movie App is free and can be downloaded from iTunes Store now. The Movie App is optimized for Apple iOS 4.0 and above. The Movie App synchs with the Blu-ray disc of Sherlock Holmes: A Game of Shadows to provide enhanced content and interactive features. The Movie App acts like a remote control for your Blu-ray player taking you to specific scenes in the film and into the Maximum Movie Mode that complement the different chapters in the App allowing you to watch at your own speed instead of having to keep pace with the film. Noted Sherlock Holmes expert Leslie Klinger consulted on the Movie App contents.